When you or a loved one are first diagnosed, it's not uncommon to feel alone and uncertain of where to find the best information and people that can help you now. We believe in making it easy to find the best people around you to help you get the answers you need, and to find support from people who can truly relate. The main currency on our site is trust – the more you share in posts and your stories, the more questions you ask and answer, the more your support will be valued by other members. MyFibroTeam is the only social network where you can truly connect, make real friendships, and share daily ups and downs in a judgment-free place. Activity page is where everyone posts updates – including images, stories, thoughts and anecdotes. It's where daily triumphs and trials are shared and supported. Find People Like You based on location, your diagnosis, and age. You can browse everyone's story and updates, which helps provide insight as you share with others. Q & A section enables you to search previously asked questions and answers, and gives you the ability to ask your own question that will be answered by others on MyFibroTeam. Find Providers best suited to meet your needs based on keyword and zip/postal code or city, and you can see which ones other members have recommended. The spirit of the site is to foster a welcoming community with open arms. Maintaining an atmosphere free of judgment and drama is very important to us to make sure every member can share their experiences, thoughts and feelings as openly as they wish. All of our members share compassion and deep empathy for each other's journey. When signing up, many people feel shy at first, but quickly discover new friends and people who truly understand what you're going through. Once you begin interacting on the site by posting updates, or sharing your story, even answering other's questions, you’ll quickly feel embraced and accepted by the team of individuals already on the site, who are, by all measures, strangers, yet feel closer than well-intentioned friends and family. Who are we? Who sees your information? We are an independent, venture-capital backed startup (called MyHealthTeams) based in San Francisco, working hard on a mission we love. All of the features on the site are designed with one goal in mind; to connect you with others who have been in your shoes. Today with millions of members, millions of conversations, and a presence in eight countries, MyHealthTeams has become the fastest growing and most engaging set of social networks for web and mobile apps in healthcare. MyFibroTeam should not only provide you emotional support through the social network, but also be a resource for practical tips, personal experiences, and even referrals to other great doctors from the community. Information shared on the site can be seen by everyone who signs up for an account, but that is it. You can share as much or as little as you like. On occasion, we will partner with a pharmaceutical company or university if we believe it will benefit our members. We do not allow them on the site, and any information that we share with them is completely anonymized. Please know that anytime we do a partnership or research - we will always let you know and we will be completely transparent about it. We will always respect and protect your privacy. Most important, we will continue to look for ways to empower people on MyFibroTeam and on the other social networks we've launched. You can check out a complete listing of all our sites on www.MyHealthTeams.com. 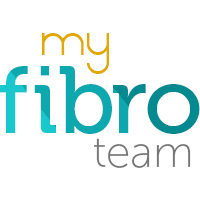 If you ever have any concerns or questions, we can always be reached at support@myfibroteam.com.